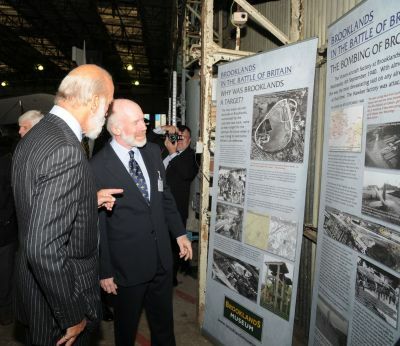 The role of Brooklands in the Battle of Britain is celebrated in a new exhibition at the Brooklands Museum which will run through the summer of 2011. Brooklands, just off the M25, near its M3 junction in South London, was the world’s first purpose-built motor racing circuit in 1907 the prototype for Indianapolis and true forerunner of today’s Silverstone. 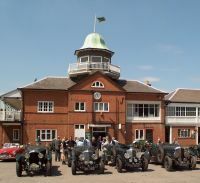 Brooklands was not just a car racetrack but the centre of motoring excellence . When WWII began in September 1939 the motor racing, for which Brooklands was renowned, ceased and was never to return. Instead, attention turned to the war effort and aircraft production was expanded on a huge scale. 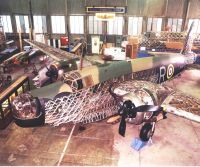 The Vickers-Armstrong and Hawker aircraft companies had exclusive use of the site for military aircraft production; ultimately, 2,515 of the 11,461 Vickers Wellington bombers built, and 3,012 of more than 14,000 Hawker Hurricanes, were assembled at Brooklands. The new exhibition – entitled "Brooklands in the Battle of Britain" – is situated in the Museum's 'Wellington Hangar' beside a Hurricane aircraft which was recovered from Russia in 1997, and explains why Brooklands was a prime target for the Luftwaffe in 1940. The distinctive shape of the 1907 motor racing circuit made Brooklands an easily identified target and major efforts were employed to try and camouflage it, with netting strung on poles set into the concrete and mock buildings erected on the track to disguise its outline. Defences provided for the site include a series of 'Bofors' gun towers, one of which still survives on Members Hill. Surrounded by the aeroplanes themselves and photographs and artefacts from the time, the story is told of aircraft production at Brooklands and the attempts by the Luftwaffe to destroy it. The exhibition also features recently discovered photos of extensive bomb damage to the Vickers and Hawker factories during the Battle of Britain. In what is believed to be the first such public tribute to them, the names of all those on both sides who were killed in the bombing raid on the Vickers works on 4 September 1940 are also displayed in the exhibition. A special plaque unveiled by HRH Prince Michael of Kent when he opened the exhibition pays tribute to the heroism of one man, Lieutenant John Patton of the Royal Canadian Engineers, during another raid on 6 September 1940. Saving hundreds of lives (and safeguarding aircraft production from almost certain disruption) through an extraordinary act of courage Patton, along with some colleagues, removed an unexploded delayed-action German bomb that fell through the Hurricane assembly building to a safe crater where it later detonated harmlessly. Lt Patton was awarded the George Cross, with two of his comrades being awarded the George Medal, for this brave action. After the WWII Brooklands became the home of Vickers Aircraft and later BAC. 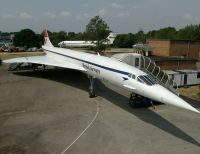 Whilst assembly of Concorde took place at Bristol and Toulouse, much of the design work and sub-assembly manufacturing was done by engineers who had worked on the Viscount, Vanguard, VC10 and BAC 1-11. The Brooklands site not only explores the aviation heritage of the location (and offers the world’s only working Concorde simulator), but includes the famous banking where on 7 October 1935 John Cobb recorded an astonishing record average lap speed of 143.44mph in his 24-litre Napier Railton. Also on display in the various original buildings is a car, motor cycle and cycle collection which includes some of the earliest 1920s Aston Martins, an assortment of Formula One cars, and various distinctive Bentley’s. Normal admission charges to the Museum apply but there is no extra charge for entrance to the special exhibition.